Fall protection when working on a site that involves open edges and roofs is extremely important, and it requires a different type of SRL. The retract needs to be designed to minimize the impact on itself when a fall occurs going over a ledge, and it needs to be able to be easily positioned either overhead, at foot level, or at the level of the leading edge. Enter the leading edge SRL. Among the many features of a leading edge SRL is their integrated shock-absorbing pack that helps limit the impact of a fall’s force on the cabling that is in contact with the ledge itself. This removes unwanted strain and keeps the self-retract strong across every inch of its construction. This is where versatility of attachment really comes in handy. 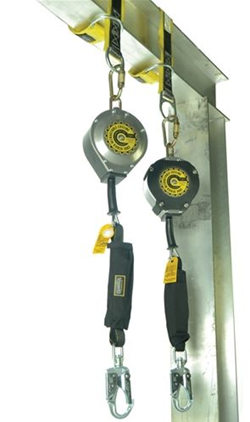 A design that allows overhead, foot level, or leading edge placement allows you to cater your attachments to the work environment without worrying about stress on the cable housing. The Guardian Heavy Duty Edge does just that. Leading edge SRLs like the Guardian Heavy Duty Edge Series SRL pictured at right are designed to be compact and lightweight without sacrificing strength, stopping power or comfort. In fact, leading edge SRLs like this one will keep arresting forces below 900lbs and has a swivel top to prevent tangling. Their shock packs spring into action when a cable comes in contact with an edge and will arrest the forces of any fall. These built-in shock packs give you that attachment versatility we’ve been talking about. Other brands and models will require overhead attachments only. Not so with Guardian. Meeting or exceeding all OSHA and ANSI standards, leading edge SRLs are top of the line and the future of edgework safety. Perfect for roofing jobs and high-rise buildings, leading edge SRLs are a must-have. See for yourself why so many construction firms have turned to leading edge SRLs for their ledge jobs, and give the Guardian Heavy Duty Edge series a go when you’re shopping with Harness Land.